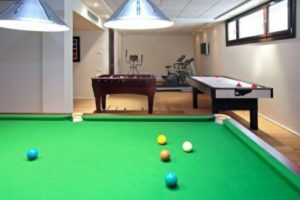 A basement finishing system is the perfect way to transform the basement in your Annapolis, Maryland, home from a forgotten storage space to a functional entertainment area. At Allmaster Home Services, we make it easier than ever to revamp the bottom floor of your home. As a leading home improvement company that has served the region since 1987, we are proud to offer a wide variety of products and solutions to meet the needs of your particular home improvement project. Whether you want a simple basement finishing system installed or are in need of a comprehensive basement solution that addresses water management and crawl space encapsulation, we have the experience and expertise required to not only get the job done, but to get it done right. What’s more, we also offer a number of additional services to complete your remodel, including flooring, framing, sheetrock, insulation, and more. No matter what preferences or needs you have for your basement, Allmaster is the company you can rely on. For more information about the basement finishing systems and services we can provide for homeowners in and around Annapolis, MD, contact Allmaster Home Services today.